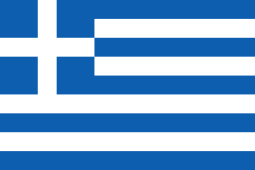 Tzatziki (English pronunciation: /tætˈsiːki/, /tsætˈsiːki/, or /tɑːtˈsiːki/; Greek: τζατζίκι [dzaˈdzici] or [dʒaˈdʒici]; Turkish: cacık) is a sauce served with grilled meats or as a dip. Tzatziki is made of salted strained yogurt (usually from sheep or goat milk) or diluted yogurt mixed with cucumbers, garlic, salt, olive oil, sometimes with vinegar or lemon juice, and some herbs like dill, mint, parsley, thyme etc. It is always served cold. The Greek word tzatziki comes from the Turkish word cacık which in turn is likely a loanword from the Armenian word cacıg. The root cac is likely related to several words in Western Asian languages. Persian zhazh (ژاژ) refers to various herbs used for cooking. Evliya Çelebi's 17th-century Seyâhatnâme travelogue defined cacıχ (cacıg) as a kind of herb. 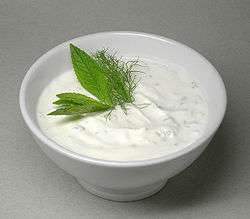 Ahmet Vefik Pasha's 1876 Ottoman Turkish dictionary defined cacık as an herb salad with yogurt. This remains the most common definition today. There are dishes similar to cacık called tarator in many Balkan countries. In Bulgaria and Serbia, the same dish is known as "dry tarator" (Bulgarian: сух таратор, Macedonian: сув таратур, Serbian: сув таратор), or as "Snezhanka" salad (салата "Снежанка"), which means "snow white salad", and is served as an appetizer. During preparation, the yoghurt (Bulgarian: кисело мляко, Macedonian: кисело млеко, Serbian: кисело млеко) is hung for several hours in a kerchief and loses about half of its water (drained yogurt, Bulgarian: цедено кисело мляко and Serbian: цеђено кисело млеко. The cucumbers, garlic, minced walnuts, salt and vegetable oil are then added. Tarator is a popular salad and dip in Serbia rather than a soup; it is also known as "tarator salata". It is made with yogurt, sliced cucumber and diced garlic, and served cold. In Albania Tarator is a very popular dish in summer time. It is usually served cold and is normally made from yoghurt, garlic, parsley, cucumber, salt and olive oil. Fried squids are usually offered with Tarator. In Cyprus, the dish is known as talattouri (cf. 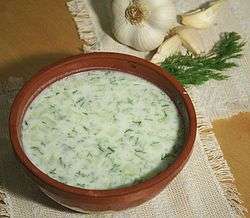 tarator), and recipes often include less garlic and includes the herb mint, unlike the version used in Greece. Greek-style tzatziki sauce is served with grilled meats or may be served as a mezze alongside other mezzes, dishes and ouzo. Tzatziki is made of strained yogurt (usually from sheep or goat milk) mixed with cucumbers, garlic, salt, olive oil, and sometimes lemon juice, and dill or mint or parsley. Similar dishes in Iraq are known as jajeek. They are normally served as meze to accompany alcoholic drinks, especially Arak, an Ouzo-like drink made from dates. A similar dish is made in Iran, called mast-o-khiar literally meaning yogurt with cucumber. 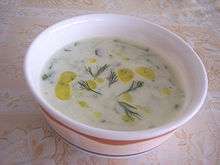 It is made using a thicker yogurt, which is mixed with sliced cucumber, and mint or dill (sometimes chopped nuts and raisins are also added as a garnish). Turkish cacık is made of yoghurt, salt, olive oil, crushed garlic, chopped cucumber, mint. Among these ingredients, vinegar (mostly white grape or apple), lemon juice, and sumac are optional. Dill and thyme (fresh or dried) and sumac and paprika may be used alternately. Mostly, cacik is served to accompany main dishes. As a side dish, it is diluted with water, which results in a soup-like consistency. If consumed as a meze, it is prepared undiluted but follows the same recipe. Often, dill and thyme are added as well. Ground paprika may also be added if it is prepared as a meze and to be served with some grilled meat, other mezes or rakı (a Turkish spirit similar to Greek ouzo). More rarely, it is prepared with lettuce or carrots instead of cucumber under the name of kış cacığı (winter cacık) or havuç tarator. Haydari is a dish of the cacik type, consisting of certain herbs and spices, combined with garlic and yoghurt. It differs from cacık in that the recipe contains no cucumber and calls for strained yoghurt or labne. It is served purely as a meze,being more pungently appetising - by virtue of being saltier, more acidic and of a thicker consistency - than cacık. In Turkish and Greek cuisine, purslane salad is very common and since such salad is made with yoghurt and cooked or uncooked purslane and thus may also be called cacık. Carrots and other vegetables can be added to cacık. In Turkish cuisine when cooked or uncooked carrot is added to cacık it is sometimes called havuç (carrot) tarator as also in Balkan cuisine. A variation in the Caucasus mountains, called ovdukh, uses kefir instead of the yogurt. This can be poured over a mixture of vegetables, eggs and ham to create a variation of okroshka, sometimes referred to as a 'Caucasus okroshka'. Mizeria is another variation from Poland, using the same ingredients but substituting sour cream for yogurt. In South Asia a similar dish is made with yoghurt, cucumber, salt and ground cumin (sometimes also including onions) called raita. 1 2 "TÜRK DİL KURUMU". tdk.gov.tr. Retrieved 5 February 2015. 1 2 Grigson, Jane; Yvonne Skargon (2007). Jane Grigson's Vegetable Book. U of Nebraska P. pp. 239–40. ISBN 978-0-8032-5994-2. Retrieved 27 July 2010. 1 2 "Eva's Classic Greek Tzatziki Sauce". Thursday for Dinner - Cooking Videos of Family Recipes. Retrieved 5 February 2015. ↑ "BUGÜNKÜ TÜRKÝYE TÜRKÇESÝ". balikesir.edu.tr. Retrieved 5 February 2015. ↑ Razuvajeva, Olga (2009). "Slang in the Turkish Language as a Social, Linguistic, and Semiotic Phenomenon". University of Gaziantep Journal of Social Sciences. 8 (1): 299–316. ISSN 1303-0094. 1 2 "Cacık". EtimolojiTurkce. Retrieved 2014-08-27. ↑ Hoffman, Susanna (2004). The olive and the caper: adventures in Greek cooking. Workman. p. 149. ISBN 978-1-56305-848-6. ↑ Elizabeth Taviloglu. "Haydari - Meze With Strained Yogurt, Garlic and Herbs". About.com Food. Retrieved 5 February 2015. ↑ "Purslane Tzatziki". KALOFAGAS - GREEK FOOD & BEYOND. Retrieved 5 February 2015. ↑ "Pırpırım Cacığı". malatya.gov.tr. Retrieved 5 February 2015. ↑ Lisa. "Greek Vegetarian". blogspot.com.tr. Retrieved 5 February 2015. ↑ Nancy Gaifyllia. "Tzatziki with Carrots". About.com Food. Retrieved 5 February 2015.